21 Duel Blackjack is a unique online variant of Blackjack designed and released by Playtech. The basic object of the game, just as in regular Blackjack, is to get as close as possible to 21 without going over, and beat the dealer. The difference with 21 Duel Blackjack is in how you go about making your hand. The best way to explain it is as a mix of Blackjack and Texas Hold’em. You can see it as a very advance version of Caribbean Blackjack. The players and the dealer are each dealt two cards, but there are also two community cards dealt which will be used to make your final hand. There is also an ante, which is something not normally seen in Blackjack games. Scoring is the same as a regular Blackjack game. Aces are worth either 1 or 11, face cards are worth 10, and all other cards are worth their face value. A combination of an ace and a face card, however, is worth the same as any other 21 point combination. 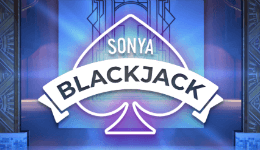 It is not considered “blackjack” and doesn’t pay more than any other win. All wins pay one to one. There is also a side bet available, the 2 Up bet, which pays either three to one or twenty one for specific hands. More about that below. The game can be played with two to eight decks of 52 cards but is usually played with six. The player must make an ante wager to play before any cards are dealt. The dealer must have a hand value of at least 13 to qualify to play. The player may not split same value cards. The player may not double down. There is no insurance bet available. The player can only hit his hand once. The player can wager on the 2 Up side bet before play begins. These rules may sound very restrictive compared to normal Blackjack rules, but the community cards make a big difference. Using the correct strategy can reduce the house edge to almost zero. How Do You Play 21 Duel Blackjack? Now that you know the basic rules for 21 Duel Blackjack, let’s take a look at how the game is actually played. First, the player has to make an ante bet. At this point he can also choose to play the 2 Up side bet. The 2 Up bet pays three to one if you make a pair between your card and the community cards and twenty to one if you make three of a kind, otherwise the bet loses. The player(s) will be dealt two cards, one face up and one face down. The dealer will be dealt two cards, both face down. Two community cards will be dealt in the center of the table, both face up. Fold and lose the ante bet (and the 2 Up bet if made). Select the left community card to combine with the player’s face up card, which requires a raise bet equal to the ante. Select the right community card to combine with the player’s face up card, which requires a raise bet equal to the ante. If the player has not made 21 with the first two cards, he will be given the option to hit or stand. 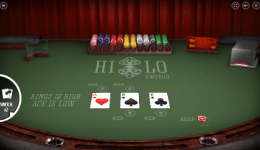 If the player chooses to hit, his face down card will be revealed and added to his total. If he chooses to stand, the face down card will be discarded. Play ends and the hand value is calculated when a choice is made. The player cannot hit more than once. 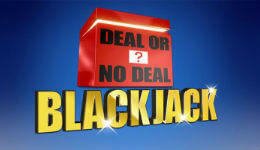 As in regular Blackjack, if the player’s total is over 21, he will lose both the ante and raise bet. If the dealer does not make a hand of at least 13, the hand does not qualify. The player(s) will win one to one on the ante bet and push on the raise bet. The dealer will hit hands of 16 and under and stand on hands of 17 and over. If the dealer goes over 21 (busts) or has a hand value less than that of the player, the player will win one to one on both the ante and raise bets. If the dealer has a hand value higher than that of the player, the player will lose on both bets. If the player and dealer have hands of equal value both bets are a push. If the player elected to make a 2 Up bet, it pays based on the player’s first card and the two community cards. 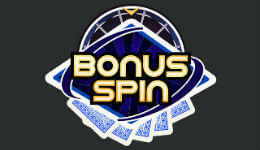 If either of the two winning combinations are made, the player wins the corresponding payout. You can, of course, get into scientific examinations of the possible odds and combinations in the game, but for the casual player, just following some simple and easy to remember strategies can significantly lower the house edge. Don’t Fold Your Hand – While surrendering you hand is sometimes the best option in a regular game of blackjack, the community cards in this game make for so many more possible combinations that it’s almost always going to be a mistake to fold. Go For At Least 17 – You want to try to get at least the minimum for the dealer to stand. Many Blackjack guides will say to stand on 16, but in this variant you’re better off hitting on 16 and standing on 17. Hit A Soft 17 – Again, most Blackjack guides will tell you to stand on a soft 17, but in this variant you’ll do slightly better hitting. Don’t Play The 2 Up Side Bet – Playing the 2 Up side bet moves the house edge up to about 6.5%, which is worse than most slot machines. If you’re going to play 21 Duel Blackjack, ignore that side bet. 21 Duel Blackjack is a very creative variant of the classic Blackjack game. The extra community cards make for a virtually unlimited number of possibilities and change the action of the game just enough to make it more exciting but not turn it into something else altogether. If you haven’t tried this Playtech release, it is certainly worth a look.